Newly released photos taken by a NASA spacecraft provide a real-world look at the Red Planet locales where much of the action takes place in the sci-fi epic "The Martian." 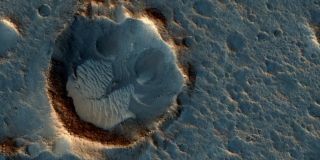 NASA's Mars Reconnaissance Orbiter (MRO) has photographed a plain called Acidalia Planitia and the southwest corner of the 285-mile-wide (460 kilometers) Schiaparelli Crater, the landing sites of the Ares 3 and Ares 4 missions, respectively, in the "The Martian." "The Martian," which hit theaters across the United States on Friday (Oct. 2), stars Matt Damon as NASA astronaut Mark Watney, who gets stranded on the Red Planet after a powerful dust storm. Watney must use his engineering know-how to stay alive by himself on Mars and get in touch with mission control, which thinks he is dead. The Ares 3 crew consists of Watney and five other astronauts. They touch down in Acidalia Planitia, a vast expanse in the northern mid-latitudes of Mars. "For the story's central character [Watney], Acidalia Planitia is within driving distance from where NASA's Mars Pathfinder, with its Sojourner rover, landed in 1997," NASA officials wrote Monday (Oct. 5) in a description of the newly released image of the area. Semi-spoiler alert: The proximity to Pathfinder is a key plot point in the movie, and in the novel by Andy Weir on which the film is based. The image of Schiaparelli Crater, which lies near the Martian equator, reveals a landscape covered by a layer of dust that's probably at least 3.3 feet (1 meter) deep, NASA officials said. While the future Ares 4 mission in "The Martian" is set to land there, NASA tends to avoid such dusty areas in real life because they exhibit significant temperature swings, and their geological potential is tough to discern (the bedrock is hidden), agency officials added.